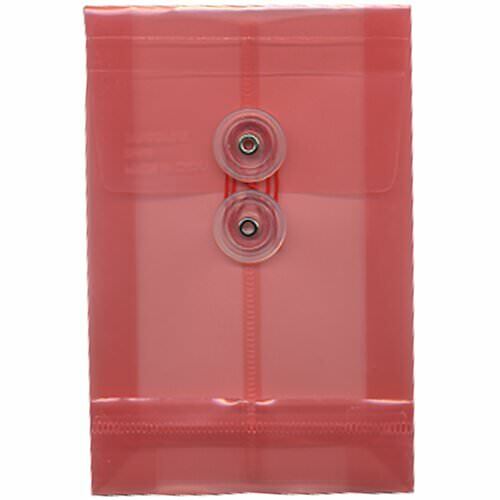 Did you know that Hello Kitty's favorite (and only) envelope she uses are these plastic pink envelopes? She's been sending love letters to her crushes Dear Daniel and Tippy in these forever! Since the envelopes are so signature, her crushes know right away that they're getting something from Kitty. Her energetic personality also matches with these bright envelopes. In fact, having these around her room makes her even happier! So when she is having a cute tea party with all of her friends, she grabs some of these envelopes, gets on her tricycle, and rides around the neighborhood handing the invites out. If you want to have that same awesome Hello Kitty fashion sense, these envelopes are for you! Also excellent for keeping sewing supplies, scrapbook materials, jewelry pieces, and other dainty treasures in. (Kitty likes to put candies in here, since they're her favorite food group).